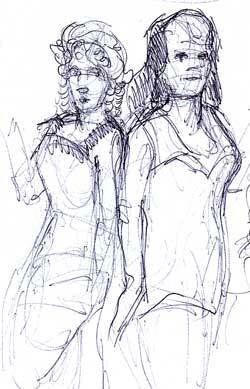 I did actually sketch the Dark Garden models at the Great Dickens Fair. Unfortunately, there was a lot of activity with a group of costumed actors swooning at the scantily clad models in the the shop’s windows. A tall man kept standing in front of me to take photos. I said, “tall man, why do you stand in front of a short girl?” But he didn’t seem to hear me; head in the clouds, I expect. My family wanted to do other things besides watch me draw. Sketching when you’re traveling with other people can try everyone’s patience. At Dark Garden’s website, I discovered the Edwardian Ball Weekend in San Francisco. Looks like fun.